I hope you have had a good start to the year. It’s February already! Last month the post named the outer parts of the cabinet of an upright piano. 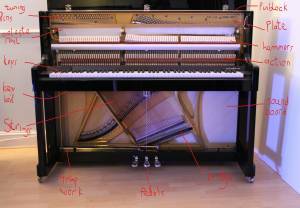 Here’s the followup naming some of the inner parts of an upright piano. 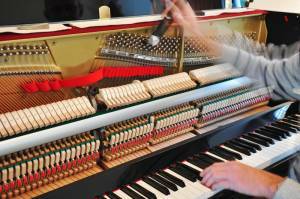 To make a piano sound, we press the keys which are themselves sat in a key bed, these in turn activate the action to push the hammers to hit the strings. There are dampers sat on the strings which lift off allowing the strings to vibrate, when the key is released the damper goes back on the string to stop the sound. I haven’t been able to show the dampers here because the celeste rail is in the way. The strings vibrate at different pitches, they are each tightened to a particular tension to give pitch which is achieved by turning the tuning pins. The pins are in a pinblock which has to withstand many tons of tension, up to 20 tons on a larger grand piano. Modern pinblocks are constructed using layers of wood glued together. The celeste rail is a layer of felt which when the middle pedal is depressed moves the rail between the hammers and strings making the sound of the piano much quieter. The trap work are simply the levers which move components connected to the pedals. The plate is the single heaviest component on a piano and is a cast iron frame. This frame is essentially the backbone onto which everything is attached. Finally we come to the soundboard which is a are large thin plate of wood constructed from pieces of spruce glued together. The benefit of this material is that it is light and flexible and as a result is able to act as an amplifier for the vibrations produced by the strings. 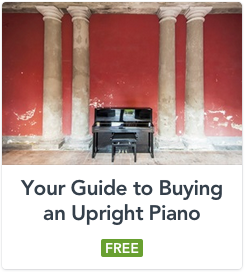 Well, that is a very potted and incomplete guide to the inside of the piano. I haven’t given you a breakdown of the component parts of the action for example, but I hope it is a helpful starting point for you. If you would like to try out some of my pianos, do give me a call or send an email to book a time for a visit.